CCleaner is our system optimization, privacy and cleaning tool. It removes unused files from your system - allowing Windows to run faster and freeing up valuable hard disk space. It also cleans traces of your online activities such as your Internet history. Additionally it contains a fully featured registry cleaner. Version 5.56.7144 is a freeware program which does not have restrictions and it's free so it doesn't cost anything. 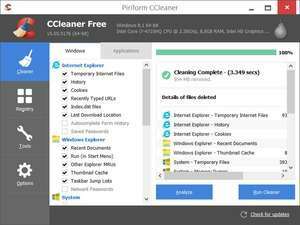 For security reasons, you should also check out the CCleaner Portable download at LO4D.com which includes virus and malware tests. Additional screenshots of this application download may be available, too.